Purpurite is a manganese iron phosphate mineral. Its crystal system is orthorhombic. Purpurite is a beautiful purple stone that is transparent to opaque with a vitreous to sub metallic lustre. 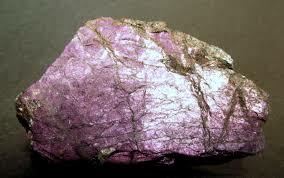 Specimens of purpurite can also be found in pink and lavender depending on the amount of manganese and iron in the stone. It occurs most often as an oxidation mineral on the surfaces of a related mineral called Triphylite. Purpurite’s name is derived from its vivid purple colour. The best specimens have been found primarily in Namibia, other quality stones can be found in Australia, USA and France. This is a rare stone but well worth the search. 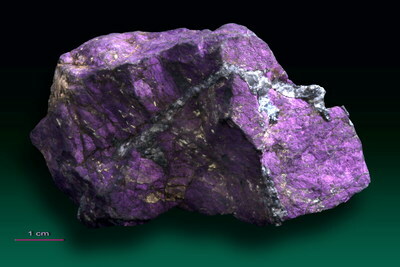 Purpurite facilitates house sales where adverse environmental or community interference is blocking a sale, particularly where past life conflict has been recreated. Purpurite helps to alleviate problems with wounds, cuts bruises, excessive bleeding, pulse rate, high blood pressure and other blood circulation and oxygenation problems, heart palpitations, adverse effects of radiation from any source, sunburn, acidity of the stomach or urine, increased absorption of nutrients. Purpurite is a rejuvenating stone, it energises the physical and mental bodies, overcoming tiredness and despondency on all levels. 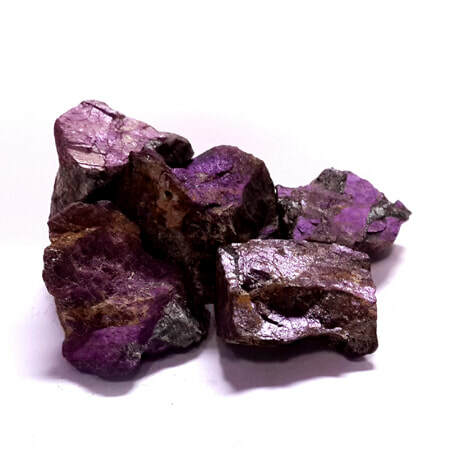 Purpurite facilitates the incorporation of more electromagnetic energy into the body. It stimulates brain function and can help repair brain damage by building electromagnetic bridges between neurons. Purpurite encourages those who have self imposed limitations or self effacing tendencies to become more proactive. It reduces victim and martyr complexes and also calms panic attacks. This stone helps in releasing stress and calming the nerves. It helps to let go of worry and anxiety and walk with grace through the storms of life. Purpurite is a stone of freedom. It allows you to see the psychological barriers that keep you chained to the secure yet deadening routines of daily life, and it gives you the inspiration to break free. This stone teaches you to love the unknown and to be at home in an indeterminate future. It helps you to find the courage to leave behind your familiar sense of self and to seek the spiritual promise of a greater identity, which you can feel, even when you have no clear concept of what that entails or whether you will be able to find the means of comfortable survival along that path. Purpurite is a stone that encourages you to feel free to speak out. It gives you the confidence in your abilities to verbalise your thoughts clearly. If you have been aware of any self-destructive situations, that may be limiting your personal growth, this stone helps to clear these problems. Purpurite will give you confidence, freedom and clarity of speech. If you are doing public speaking this stone will benefit you, as it encourages your thoughts to be clear and focused. It helps you to deliver the information that others require and to speak with confidence. It may create a feeling of accord with those you are speaking to, and will bring spiritual information through where needed. Purpurite is a stone of insight and truth. It helps you to ‘keep digging’ for the reality that underlies appearances. It allows those who utilise oracles such as the tarot or I Ching to more clearly understand the guidance that they receive. It reveals the deceptions of others, and it makes you incapable of consciously deceiving others. If you have been doing this unconsciously, it makes you uncomfortably aware of what is happening, which usually ends the behaviour. It helps those who are afraid of power overcome their hesitation. Its energy of purification protects you from the temptation to abuse power, and its quality of inspiration reveals the highest paths of action for putting the power to the best use. 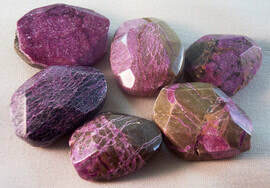 Purpurite opens the higher crown chakra and linking it to the base chakra, it stimulates unimpeded evolution and grounding, the resulting energy shift moves you into functioning reality. It can activate the crown chakra, opening you to experiences of consciousness within the higher spiritual realms. Purpurite emanates an energy of psychic protection, cleansing your auric field and keeping it free of negative entities and attachments. Purpurite is a stone of initiation. Working with it in meditation, you can make a conscious connection with your spirit guides and hear their advice more clearly. In the sleep state, Purpurite’s presence near the body supports the separation of the astral body from the physical, and it allows you to remain conscious during and after this process. In the dreams that follow, you may move into a space in which you are aware of your angelic guides. Purpurite is a master stone of spiritual embodiment and aligning the mind to the greater mind of the Divine. Purpurite teaches you to walk on the Earth with grace and beauty and to use your earthly experience as an opportunity to enlighten the physical plane.